The Rehabilitation Institute at Palmdale Regional is designed to help patients with disabling physical or neurological conditions restore function and enhance their quality of life. The unit features 27 private rooms and specialized areas for training and activities. It is the goal of the Rehabilitation Institute to return the patient to their prior functional status through specialized inpatient rehabilitation. In the healthcare setting, communication among the interdisciplinary team is a key element in successful patient outcomes. This especially holds true in the Rehabilitation Institute at Palmdale Regional, where a well-organized and coordinated team of inter-professional healthcare members collaborate, including physical therapists, occupational and speech therapists, nurses (24 hours), unit director, medical director (a physiatrist) and pain management specialist. The "Guidelines for Adult Stroke Rehabilitation and Recovery: A Guideline for Healthcare Professionals" from the American Heart Association/American Stroke Association (AHA and ASA) state, “The studies that have compared outcomes in hospitalized stroke patients first discharged to an inpatient rehabilitation facility, a skilled nursing facility, or a nursing home have generally shown that inpatient rehabilitation facility patients have higher rates of return to community living and greater functional recovery, whereas patients discharged to a skilled nursing facility or a nursing home have higher re-hospitalization rates and substantially poorer survival.” It is also noted by the AHA and ASA that stroke survivors receive preferential treatment in an acute rehabilitation setting versus a skilled nursing facility. 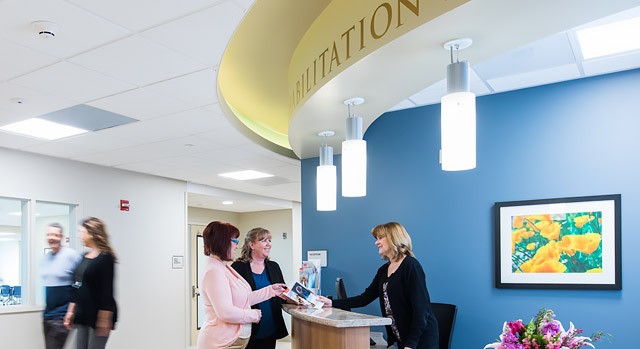 Following your stay in the Rehabilitation Institute, specialty care continues through outpatient therapy and other services at Palmdale Regional Medical Center. The Healthy Journey program at Palmdale Regional is open to anyone age 50 and older. You’ll receive a comprehensive set of benefits just for joining. The unit features innovative equipment to aid in your recovery, including the Vector Gait and Safety System®. This ceiling-mounted gait and safety system is designed to help patients improve mobility and balance while promoting a faster recovery. The system continually offsets a selected amount of the patient's weight as they move, which enables them to safely and confidently perform rehabilitative exercises. The system is designed for both physical and occupational therapy and can help patients recovering from a variety of conditions.